Welcome to the Bandelier National Park Information Page. 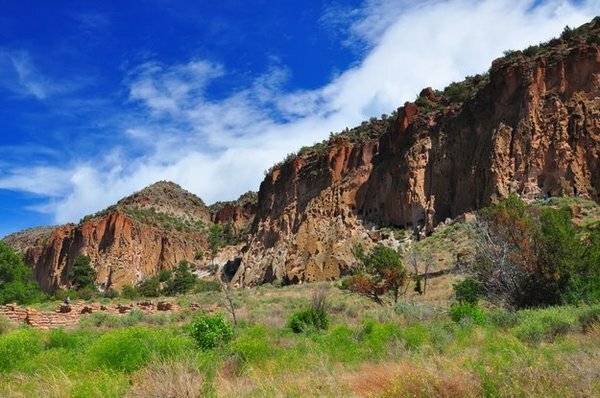 Bandelier rests on the slopes of the Jemez Mountains, with an altitude range of 5,000 feet at the Rio Grande to 10,000 feet at the peak of Cerro Grande. This landscape of hilly terrain, interrupted by abrupt canyons, was created over one million years ago by massive volcanic eruptions, and has slowly been eroding over time. The park offers a large variety of habitats to wildlife and is home to a diversity of species. The most common animals to see include mule deer, Abert’s squirrels, lizards, birds, and butterflies. Birders can look for Stallar’s Jays, Canyon Towhees, Mountain Chickadees, Turkey Vultures, Western Tanagers, Black-headed Grosbeaks, Sandhill Cranes, and Black-chinned and Broad-tailed Hummingbirds. Mammal enthusiasts can search for bats, mountain lions, deer, elk, and squirrels. Smaller wildlife to find include tarantulas, tarantula hawk wasps, Mourning Cloak, Orange Sulfur, Swallowtail, Monarch, and California Tortoiseshell butterflies, millipedes, Horned, Whiptailed, and Fence lizards, skinks, Rattlesnakes and Bullsnakes. Beautiful blooming cacti and desert succulents to see include hot-pink Cane Cholla, yellow or pink Prickly pear, and red-orange Claretcup cactus. Visitors can also see colorful wildflowers such as orange Butterflyweed, mauve and green Antelope’s Horn milkweed, white Yucca and Canada Violet, pale pink Wild Rose and Mariposa Lily, and blue Wild Iris. Humans have inhabited the Bandelier area for over 10,000 years. The earliest residents were nomadic hunter-gatherers but the first permanent settlements are estimated to have been constructed around 1150 CE. By 1550, Cochiti, San Felipe, San Ildefonso, Santa Clara, and Santo Domingo had become homes to the Ancestral Pueblo people along the Rio Grande because resource depletion and sever drought forced them to find new land. In the mid-1700’s Spanish settlers moved into Frijoles Canyon and later brought Adolph F. A. Bandelier to the area. President Woodrow Wilson officially named Bandelier National Monument in 1916 and most of the work to create the park infrastructure was finished by 1941. During World War II the park was closed to the public for a few years and was taken over by the military to house Manhattan Project scientists. The Bandelier Visitor Center focuses on the cultural history of the area, and the museum includes an Ancestral Pueblo pottery exhibit and two life-size model representations comparing past and present Pueblo life. The park and Visitor Center are open daily except for holiday closures December 25 and January 1 and extreme weather closures. Cultural Demonstrations occur every summer weekend between Memorial Day and Labor Day and include pottery- and drum-making, flint-knapping, wood-carving, traditional dancing, painting, outdoor bread-baking, and making blankets out of turkey feathers. Nightwalks are led by a ranger once a week during the summer and twice between December 25th and New Years Day. They are silent, hour-long walks through the dark. Fee is $6 per adult and $3 per child. The visitor center also provides information about other outdoor activities in the park, such as cross-country skiing or birdwatching. Juniper Campground is sized for individuals or groups of 10 or fewer. It is open all year except for snow closures or emergency closures such as wildfire danger. The campground does not take reservations but only rarely fills to capacity. Fees are $12 per night. Facilities include running water, restrooms, grills, picnic tables, large vehicle parking, and one pay phone. Ponderosa Campground is made up of 2 group sites for 10-50 people. It is usually open from mid-April to late October. Reservations are required, and calling long in advance is recommended because of high demand. Fees are $35 per night or $35 per day for day use only. Reservations can be made by phone by calling (505)672-3861 x 534. Facilities include picnic tables, fire grates, cooking shelters, and pit toilets. There is no running water. Backcountry camping is available with a free permit which can be obtained from the visitor center. The nearest site is about 2 miles from the visitor center. Many Bandelier trails are steep and can be ice in the winter, and some mapped trails are no longer maintained, so call the visitor center at (505)672-3861 x 517 to check on current trail conditions before planning your backpacking route. There is very little water running through the backcountry. Be sure to carry with you more than you think you will need for your entire time out on the trails. Rattlesnakes are common especially in riparian (river-side) zones and rocky slopes. You may also encounter pumas, black bear, or bobcats. Remember to hang your food high at night to keep away raccoons and ringtails. Bandelier weather can be unpredictable, so always be ready for hot, cold, wet, and dry weather at any time of year. The following are typical weather patterns for the area. Spring in Bandelier is known for beautiufl wildflowers, the return of many beautiful species of migratory birds, and dramatic weather. Sunny clear days with temperatures reaching above 70 degrees can be followed by snowy wet days with 40 degree temperatures. June is often the hottest and dryest month of the year. July, August, and September can bring sudden thunder and lightning storms which dump large amounts of water quickly with little warning. Deep blue skies and changing leaves make Autumn in Bandelier a gorgeous season to experience. Daytime temperatures are mild but the first snow can fall anytime from the end of September through early November. Deep snow comes in winter – the yearly average snowfall around the visitor center is around 25 feet. Some areas of the park are closed off by snow, but the landscape views can be amazing.